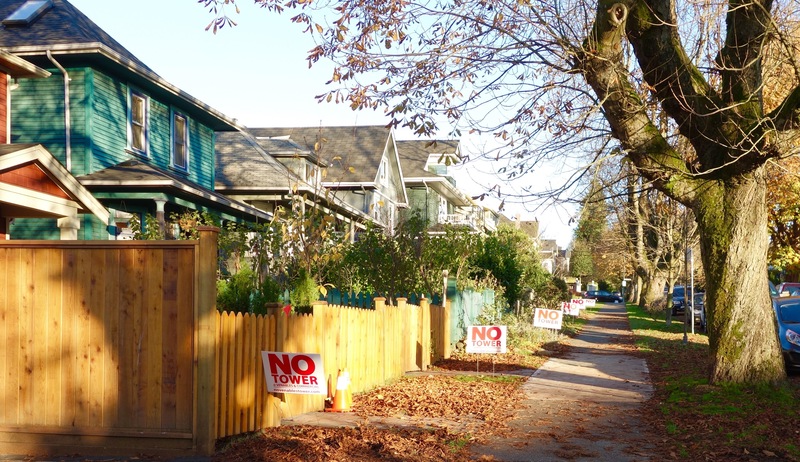 The Spot Rezoning Moratorium concept is a reminder that the campaign against the Boffo Tower is also part of a more general move toward community control of development within their own neighbourhoods — a movement fought tooth and nail by developers, speculators, and some at City Hall. A Spot Rezoning Moratorium disallows lot rezoning for a set period of years after the implementation of a Community Plan. In other words, the social contract implied by an agreed Community Plan cannot be broken for a reasonably long period of time. 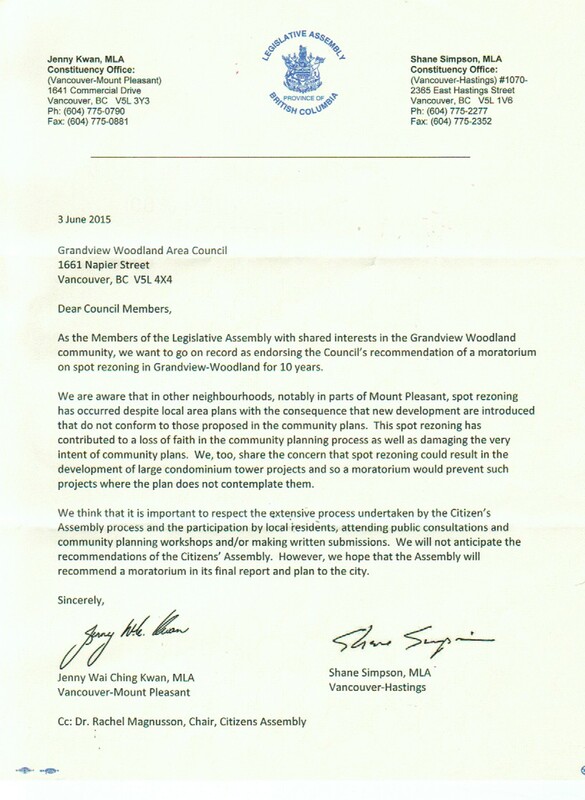 Several groups and individuals, including the Grandview Woodland Area Council (GWAC), Our Community, Our Plan (OCOP), and the NO TOWER Coalition pushed for the adoption by the Citizens’ Assembly (CA) of a Ten Year Spot Rezoning Moratorium. We were pleased to have obtained the endorsement of both of Grandview’s MLAs, Jenny Kwan and Shane Simpson, for this proposal. One group, at least, within the Citizens’ Assembly took up the idea and pushed it forward. However, the idea slipped through the bureaucratic cracks and never made it into the final report. A Spot Rezoning Moratorium, or some other mechanism for achieving the same result, is the only guarantee that our Community Plan will actually be adhered to. Without it a developer could come with an application to the very next Council meeting after the adoption of the Plan, apply for and be granted a spot rezoning, thus entirely negating the years of “consultation” and negotiation that went into the Plan. Posted in Spot Rezoning on November 26, 2015 by pennystreet546. Dana Cromie is a longtime resident of Grandview and has an active interest in our local affairs. He had heard about the Boffo Tower proposal and, when approached by Boffo’s PR surveyors, told them of his concerns about the project. Daniel Boffo, of Boffo Properties, heard about Dana’ concerns and agreed to meet with him; which they did, for about an hour. Dana was also given a tour of the Kettle’s current facilities. After these meetings, Dana gave some serious thought to the proposal and eventually penned a letter to Daniel Boffo, which he has graciously allowed us to publish here. Firstly, Daniel, I want to thank you for initiating our meeting; and Nancy, for the very personal tour of the Kettle facilities. I understand the challenges presented to those you are helping and in no way wish to hinder further progress in your endeavours. After discussing the now-worn topics surrounding the Kettle development with you, and my taking some weeks to muse what, why, and where, I continue to be unable to support this project. There are several reasons why. The role of the City of Vancouver in this project is clearly larger than expected. This project fulfills several of their objectives at what the City anticipates will be little cost to them. But, there is a cost to selling city land to a project without community support; there is a cost to encouraging developers to manage the growth of community services, and there is a cost to disenfranchising the residents of a neighbourhood. It was disingenuous of the City to over-staff the May 2015 project presentation at the Wise Hall. Grandview Woodlands in its current state is a highly successful neighbourhood, with sufficient density to permit a sustainable neighbourhood. With modest development projects, it continues to densify organically within the guidelines of the existing Community Plan. The yet-to-be-finalized new Community Plan will allow for greater density within parameters negotiated between a small portion of our community and the City of Vancouver. This does not mean that the final plan is desirable; it will be a compromise accepted by the community to bring this process to a close. I witnessed first hand the City planning department’s lack of respect for Grandview residents in the initial planning process and I have heard of no reason to expect better. The Boffo/Kettle project was conceived outside this planning process and as such, needs to be regarded with deep suspicion. Finally, it is difficult to understand the argument that the Boffo/Kettle proposal will not affect surrounding and uphill land values (densification puts huge upward pressure on land values). Both Boffo and Kettle representatives repeatedly point to the Lion’s Adanac Tower as precedent. How can that logic work for Boffo but not be expected to subsequently be applied for new projects in the future? If anything, a tower will beget more towers sooner. Incidentally, advocates of the Boffo/Kettle project never refer to it as a tower. In closing, I can only conclude that the City of Vancouver is at fault for encouraging this project to be pursued, allowing it to progress despite being outside the current planning process, despite vocal community opposition and continuing to endorse its validity both as a partner and with the apparent backing of the planning department. Again, I cannot support this project. Posted in Correspondence on November 25, 2015 by pennystreet546.